Signing up to Sharequity takes less than 2 minutes and is free. Creating an investor profile will provide you with notifications and instant access to a wide range of investment opportunities. You’ll get access to information about companies looking to raise capital, from early stage seed startups to businesses wanting to list on the stock exchange. Whether you are a business looking to raise capital or a broker supporting the fundraising process, we can assist with distribution and streamlining the process. Register and easily submit an online capital raising or partner application. Our business development team will contact you within 24 hours to discuss the opportunity. 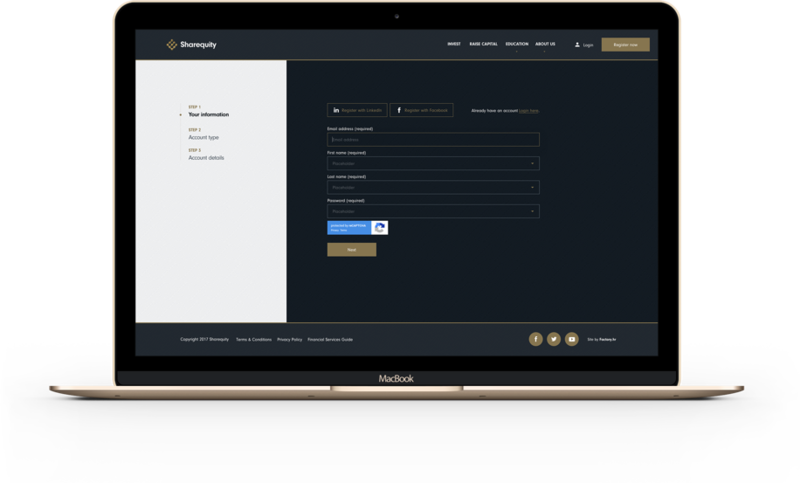 Once your company profile has been set-up you can use the Sharequity platform to securely build, submit and market your online fundraising campaigns to our actively engaged investor base. Leveraging internal expertise and 3rd party technology, our due diligence team conducts a review of the investment opportunity and supporting documentation. Once approved, the project is listed on Sharequity and marketed to potential investors. Browse Investment Opportunities by Company, Industry, Fundraising Type, etc. Search, review and invest in a broad range of companies looking to raise capital. We seek to capture and present detailed information on the investments’ financials, market data, management teams, track record and associated supporting documentation. We strive to offer investment opportunities to a wide range of investors. Whether a retail, sophisticated or institutional investor, our secure and integrated online workflow will assist with stepping you through the offer, acceptance, payment and share issuing process. All documents and agreements can be downloaded electronically. We are also working with share registries to enable investors to track purchased unlisted securities via their Sharequity dashboard. Investors review opportunities and choose to make an investment. Invested amounts are held in a third party escrow account and when the funding target is reached, the transaction takes place, with the company issuing shares and receiving the relevant funding. 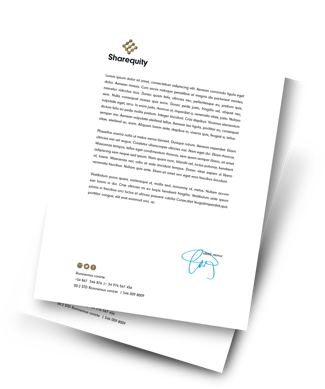 Sharequity assists companies with digital investor relations updates and communications. Contact us on 08 6102 0007, email us at hello@sharequity.com.au or view our frequently asked questions section.